Wondering how sales teams can be successful in the modern age? Read here! As a business starts to grow, the sales leaders need to implement a repeatable and scalable process to sell better and faster in order to have a steady stream of income. For which, you need a right Customer Relationship Management (CRM) system. A powerful CRM can actually help you empower your team with a well-defined process. Read on to learn how to sell better and faster using HubSpot CRM for B2B businesses. It can accelerate your business’ growth, and bring in profitable, happy customers. Gone are the days when cold calling or emailing and the “spray and pray” thingy actually worked for the sales reps. The sales process is now more about research and careful customization. More often than not, change is difficult to attain. But with the right CRM system, one can not only enable salespeople to update their practices but also give them a competitive edge. Today, instead of picking up the phone blindly or writing a cold email, reps can research about their buyers on various platforms like Search engines, LinkedIn, Facebook, Twitter, Blogs, Company website, Industry-specific sites, etc. The only problem for the sales reps is that these virtual platforms don’t give them the context on what the contact already knows about their company. This gap can be bridged with the help of a CRM that integrates with your marketing automation system and gives a better picture of the prospect’s interactions with your company. And this, in turn, helps the sales reps to customize their emails and calls so they can eliminate the generic pitch. Persistence is a virtue in sales. Abandoning prospects too soon is not the option. A sales rep needs to reach out again and again to gain a prospect’s attention. Most of the CRMs include task modules that automatically alert sales reps of who to follow up with and when. 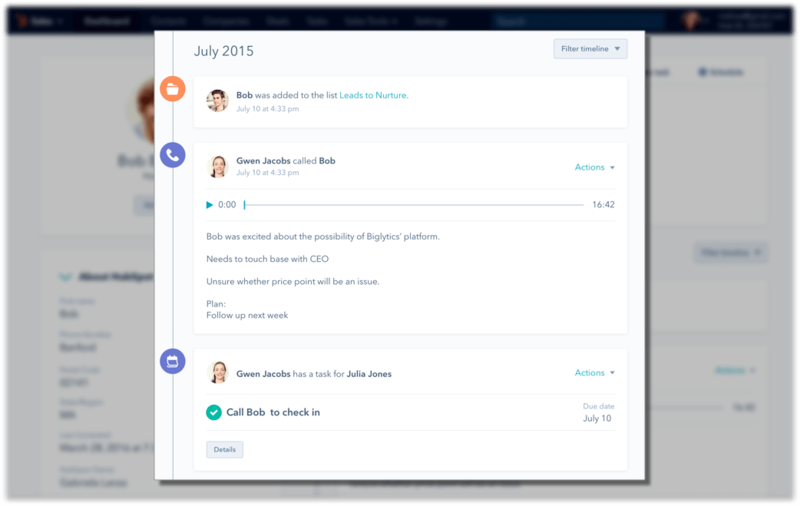 HubSpot CRM automatically saves voicemails and emails, as well as all the buyer interactions. With the right context at hand, salespeople can tailor their follow-ups based on the buyer’s actions and interests. This increases the possibility of getting responses from the prospects. It’s really tempting to close each and every deal you’re working on during the last week of the month. But with an empty pipeline, you might not be able to close any deals in the next month. Been there? Done that? But fret not, a good CRM system can help you avoid boom and bust cycles by visualizing your deal flow. As a salesperson, you can also balance and prioritize prospecting with working active leads. Defining the sales stages in a CRM is very effective. It not only helps to firm up the process for your current team but also has implications for future hires. The screenshot below shows how you can define sales stages the HubSpot CRM, and how deals can be moved between them. “CRM” practically translates to “thing that slows me down” for most sales reps. However, modern CRMs can actually quicken the sales process instead of bogging it down. Here’s how CRM can actually save time, and facilitate a faster deal flow. It’s critical to streamline reps’ non-sales tasks as much as possible to maximize active selling time. Manual data entry into a CRM not only slows down the process of connecting with prospects but also lessens the chances of the information being accurate. By using email productivity app HubSpot Sales in conjunction with HubSpot CRM (both free), sales reps can live the dream of one-click prospecting. Simply by pushing the “add to HubSpot CRM” button, sales reps can auto-populate a new contact record directly from a company website. HubSpot CRM collects sales relevant information from across the web on a variety of companies and then compiles data into a searchable database. Reps can then conduct custom searches based on specific criteria, and the system returns a comprehensive list of prospects that fit the requirements. Keeping in mind the amount of time reps waste looking for content, CRMs that double as content repositories can help salespeople get the right content at the exact right moment. You can also smartly save the templates of your most successful messages for reuse so you don’t have to dig through your inbox every time. CRM puts all the information about your customers and your products/services in one place, so you have a single source of legit information. This enables you to answer any of your prospects’ questions instantly. Are you ready to sell better and faster with the help of a modern CRM system? It is easier said than done. Book a free demo for HubSpot CRM with the CRM Experts at Prodigitas and watch how it can make your business soar!